In this review we explain why you should exercise extreme caution when considering investing money with Velox 10. The presentation of Velox 10 is pretty vague. It says that Velox 10 offers payment solutions and services and that it works with bitcoin and other cryptocurrencies. We were not able to find more. Velox 10 that is based in Brazil and somehow cooperates with X7 Capital from Singapore. Again, difficult to say what X7 Capital is about and what they are doing. The main thing is that Velox 10 is offering investment plans with up to 1.2% daily returns, which means 36% per month. We investigated about Velox 10 and X7 Capital. 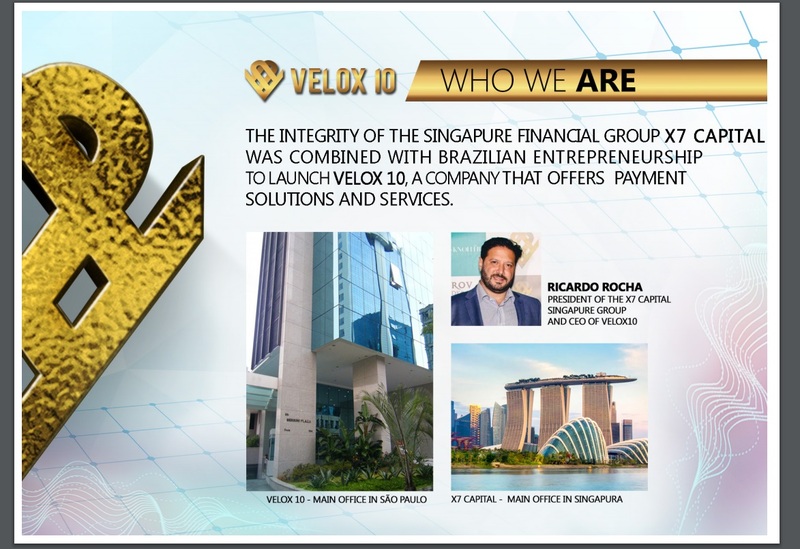 According to the companies register of Sao Paolo the company Velox 10 was established in 2017, meanwhile according to data from Singapore the company X7 Capital was established in 2016. The CEO of both companies allegedly is Ricardo Rocha. So, both companies are new, with no proven track record. But the main problem here is that Velox 10 is a company that can manage only non-financial assets. This is what its official registration says, look at our picture. Therefore Velox 10 is operating illegally, because it offers financial and investments services. Velox 10 suggests that they will trade bitcoin and other cryptocurrencies to make you earn 1% – 1.2% per day. The first thing we noticed that they even cannot get their bitcoin chart right, it shows a history of several years and not the actual price, so it is labeled in a wrong way. But the main problem is in the return ratios. 30% – 36% is a very high number. It is unsustainable in the long term. Cryptocurrencies are very volatile, so it is possible that you will make this kind of profits in one or some months, but it is impossible to make them every month. Returns in trading are never consistent, simply because markets’ behavior is not consistent. 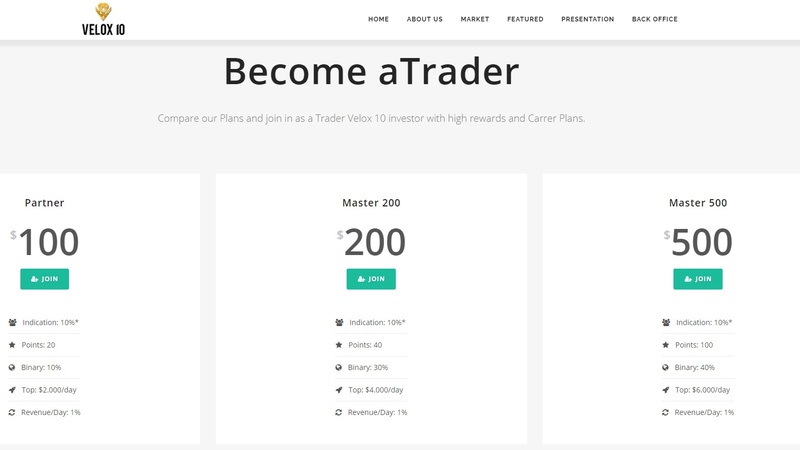 So, anybody who offers consistent daily returns is certainly not a trader. Based on our experience only Ponzi schemes offer fixed daily returns. A Ponzi scheme will pay profits from new deposits, until the systems collapses when there are not enough new deposits. Based on what we learned about Velox 10 we believe that it is a Ponzi scheme. We don’t see any proof that there is any kind of real cryptocurrency trading going on behind. 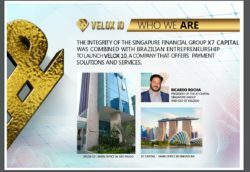 Velox 10 is a company that has no authorization to provide investment or financial services and based on returns between 30% and 36% per month we believe it is a Ponzi scheme. Making money in cryptocurrency trading is definitely possible, but it takes time and learning. You can try it on a free demo account to see how it works and what is really possible. You will need to build a profitable strategy before you can start trading with real money. Hi, Bitconnect seems legit, but don’t take my word for it. Cryptocurrencies are not regulated, so do your research and try to find as many real testimonials as you can. Update: Bitconnect seems legit as a cryptocurrency, but the lending program with 40% monthly must be a Ponzi scheme. PPLE WANT MONEY WHTHER PONZI OR WHATEVER MONEY! What is this velox 10 in Kenya???. Am told some leaders in this velox 10 in Kenya were arrested and arraigned in court for taking Kenyans money in pretext that they the investors will be earning. All of a sudden nothing happened. The leaders of velox 10 in Kenya were arrested by the Directorate of Criminal Investigation officers and taken to court in Nairobi.